ATTENTION: WILL NOT FIT NIGHT VISION OPTION! Finally, the long awaited BMW F10 Carbon Fiber black kidney grilles are available here at ModBargains! These F10 kidney grilles are direct placement of your stock chrome kidney grilles and will give your F10 a new sleek look. 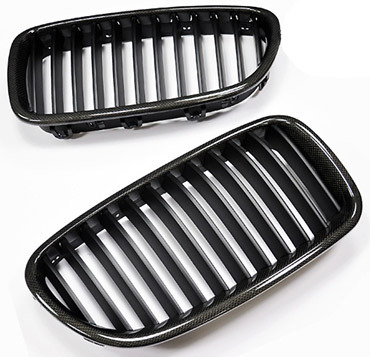 Ditch the old-man chrome look with a sporty and modern Carbon Fiber black set of kidney grilles. They come in Carbon Fiber black and are made out of durable ABS plastic. Give your BMW F10 that special added touch you have been looking for with these BMW F10 Kidney Grilles. Why should I buy BMW F10 Kidney Grilles from ModBargains? Before each product is released, they go through rigorous tests, including test fitting on several OEM vehicles and the actual vehicles to ensure that the product is free from manufacturer defects.